When Sal began arguing with his mom all the time, it became clear to both of them that something needed to change. His mom heard about Mercy Home from a friend who used to work here, and told him about it. Sal decided that Mercy Home was a place he wanted to be. Immediately after moving in, he embraced all our Home had to offer. “It was new, so I was open to everything,” he remembered. Right off the bat, Sal enjoyed meeting the other boys at our Home and hearing their stories. “I met people that I thought were similar to me [but] they’ve been through stuff … and I realized how lucky I am to have my mom and my family,” he said. He also gained an appreciation for our Mercy Home coworkers, who consistently encouraged him to do his best. “The staff are always pushing me to do more, even if I don’t want to,” he said. His advocate, Christina, explained that there is a very good reason that the staff push him—they know he can accomplish great things! Now two years into his time at Mercy Home, Sal has been busy building his skill set in his chosen field, Information Technology (IT). His interest in IT was piqued by his love for video games, he explained. “I like video games, so IT was the closest thing to it, and I just got interested and stuck with it,” he said. IT has quickly grown into Sal’s biggest passion. When he came to Mercy Home, he began an internship in IT at the Chicago Transit Authority. He then participated in the Year Up program, which helps students build skills that will give them access to careers. He also did another internship at a veterinary specialist center, where he honed his skills. He is now working for an information services company, where he is the tech support and helps customers set up automotive software. He is also considering more schooling in IT. In addition to working toward his career goals, Sal has been working on repairing his relationship with his mom. Christina also noted that she considers Sal one of the “silent leaders” of his home at Mercy Home. And when Sal reflects on all he’s learned at Mercy Home, it is difficult for him to choose just one thing. “I’ve learned a lot!” he said. We are so thankful to friends like you who allow us to give our children opportunities to learn and grow! 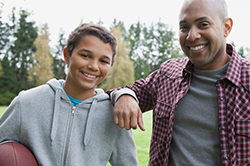 Deandre’s time at Mercy Home helped him improve both his grades and his relationship with his father. Overcoming the impossible; after her mother passed away, Jasmine struggled to get out of bed each day to go to school, but with the help of Mercy Home she was able to find hope and heal. It’s not where have you have been, it’s where you are headed; Yazmin gained the confidence she needed at Mercy Home to pursue a college degree and develop independent living skills. just grateful to know that mercy home is rescuing and giving stability to youths. God also smiles on it.